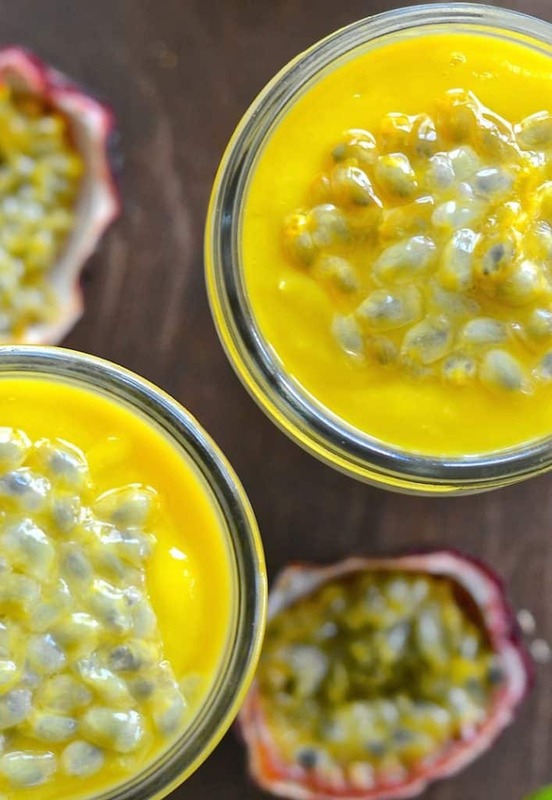 This Banana Chia Pudding with zingy, lip smacking Mango Lime Purée will bring a taste of the tropics to your breakfast. It is incredibly easy to make, positively bursting with nutrition & just looking at the wonderful yellow colour will make your day brighter! Where have chia seeds been all my life? It is hard to believe that they have actually been grown and consumed by humans since around 3500 B.C. but despite this, until a few years ago I had never heard of them. It is only quite recently that they have gained popularity and become recognized as a modern day superfood, and with good reason. They contain good amounts of calcium, protein, manganese, phosphorus, zinc, potassium, B1, B2 &B3 as well as plenty of omega 3. Whilst they are packed full of nutrients, they are relatively low in calories and because they swell upon contact with liquid they are extremely filling. When mixed with liquid, chia seeds become gelatinous so are great for using as an egg replacer in baking or for turning into a simple chia pudding. All you need to make a basic chia pudding, are some chia seeds and some non-dairy milk. Mix it all together, leave for a a few hours or overnight, and you have a basic chia pudding. You can then add some sweetener like natural maple syrup if desired, maybe a drop of vanilla extract, then top it with or stir through some fruit. If you want a chia pudding that tastes a little more decadent check out my Healthy Caramel Chia Seed Pudding. WHAT IS THE CHIA PUDDING RATIO? Knowing the right chia seed to liquid ratio to make a chia pudding with a good consistency can be tricky. That will give you a basic, plain chia pudding with exactly the right consistency. 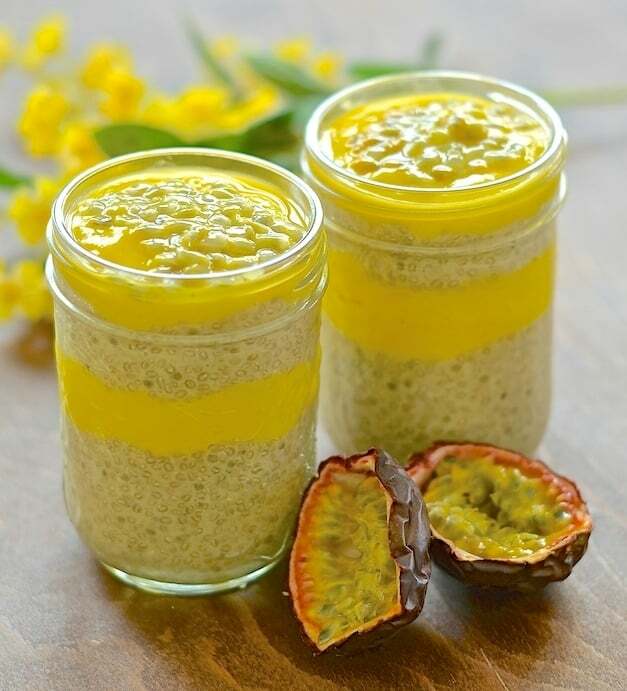 You will notice that this Banana Chia Pudding uses a slightly different chia seed to milk ratio and that is because a pureed banana is added to the mix. The banana provides its own moisture so less milk is required. Chia pudding, to me, is kind of like a blank slate. It needs a bit of oomph and that’s where I come in with this Banana Chia Pudding with Mango Lime Purée recipe. I take a basic chia pudding and jazz it up with soft, sweet, ripe banana and a touch of maple syrup for a flavour boost. Then a simple but very delicious, zingy mango lime purée is added to really liven things up. This purée with it’s combination of sweet juicy mango and tart lime is lip smackingly good. So good I couldn’t stop eating it and ended up having to make another batch for my chia pudding! Make sure you have a spare mango to hand in case the same happens to you…. On top of the mango puree I added some beautiful passion fruit seeds for an extra burst of flavour and texture. 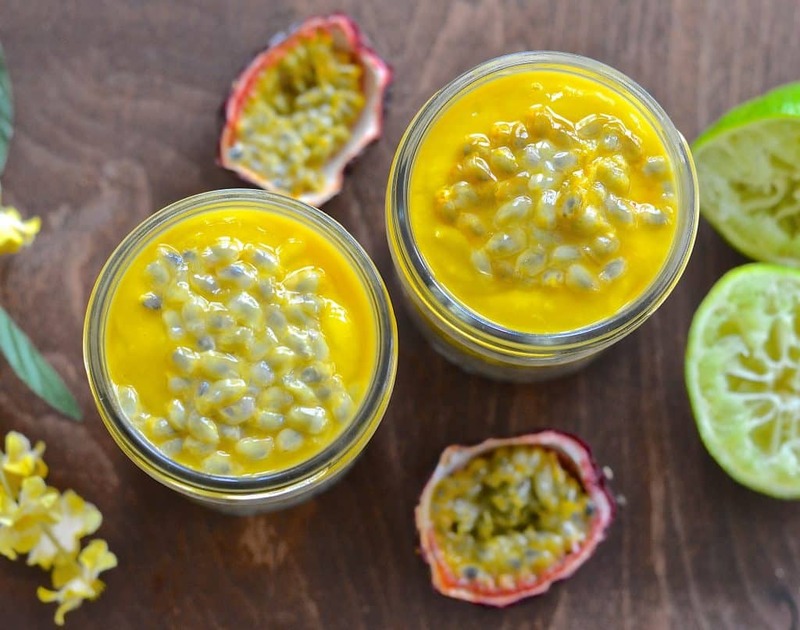 The passion fruit flavour works so well with the mango and banana chia pudding but is totally optional so don’t worry if you don’t have one to hand. 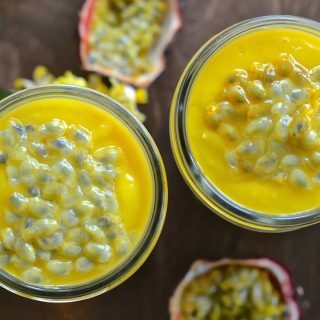 This Banana Chia Pudding with Mango Lime Purée makes a fantastic breakfast and because it is chilled it is perfect for the warmer months. Layer it up in a mason jar and it becomes a perfect portable breakfast! And if you love bananas for breakfast, why not give my amazing Vegan Banana Pancakes a try too? They are super yum! Blend the banana with the milk. If you don't have a blender mash the banana really well with a fork and whisk into the milk. Pour in the chia seeds and maple syrup and stir well. If you don't like the texture of chia seeds then you can blend it up in a high powered blender for a smooth pudding. Peel and remove the stone from the mango. Add to a blender with the juice of one lime. 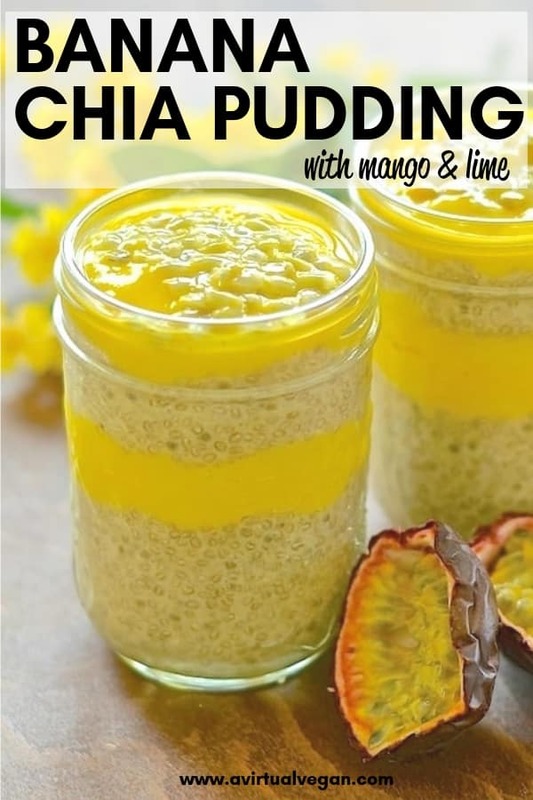 Layer the chia pudding and the puree up in a bowl, glass or jar. This chia pudding is best eaten within 24 hours but can be kept for up to a couple of days in the fridge. The pudding will become slightly darker as the banana oxidizes but this doesn't affect the flavour. Ha ha! So funny and the kind of thing I would do. Seriously though, that mango lime combo is my favourite bit so be sure to make it next time. I often end up eating it straight out of the blender. You’ll see what I mean when you try it! Thanks so much for leaving feedback June. I really appreciate it! That’s great. I am so glad you enjoyed it! Thoughts? Good or bad? It does grow on you if you weren’t too keen and if it’s a texture thing then blending it works wonders! I am definitely making this today. I will have to use frozen mango as they are pretty much gone from our shelves now (autumn in southern australia), and 15 yo daughter HATES the texture of chia so will be grinding them first. Will let you know how it goes! Ha ha! She’s fine as long as it’s smooth rather than seedy if you know what i mean! This was a hit! I tweaked a little – added raw cacao to the chia layer so it was a choc banana layer, and sweetened with dates instead of maple. The mango lime combo is sensational, and while I often think frozen mango is a bit of a disappointment, in this puree the addition of the lime meant it was almost impossible to tell it wasn’t fresh. Thanks for posting! Great! Thank you so much for letting me know. And that mango lime combo is so good isn’t it? I keep having to make extra as I eat it all before it reaches the pudding! I am glad the frozen mango worked for you. It’s good to to know for when Winter comes around. Oh my goodness – this looks like a glassful of pure sunshine! The mango is such a pretty colour isn’t it?